1. Cook basmati in a pressure cooker with the whole masalas. 2. Remove the cooked basmati in a plate and set aside to cool. 6. Add the vegetables, salt and let it get cooked. 7. Once the vegetables are cooked add the soya chunks and cook for some more time. 8. Add the cooked basmati to the vegetables and mix well. 9. Cover and cook the mixed rice for 10 minutes in low flame. ~ by priyaskitchen on September 21, 2007. 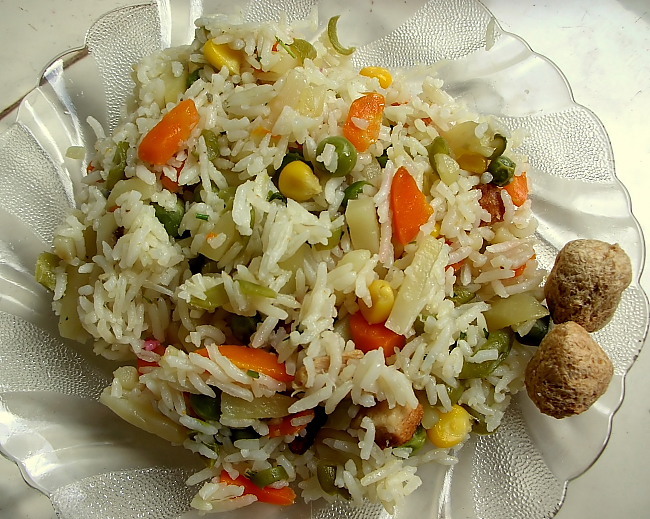 Beautiful – I love the flavour that Bay leaf adds to rice. My comfort food. I like to eat this after a long day !! I made the mixed veggie pulao for dinner today and it was perfect ! Did not add soy chunks but no problem! What I like about the recipe is that there are NO masala powders nor is there chilli powder! Just veggies, rice, whole spices n salt! Healthy and tasty 🙂 thankyou for posting the recipe !